one more thing. in heartgold i am looking for a kyogre. would you be willing to trade my shaymin or heatran for it? There's an edit button for a reason my friend, don't double, or in your case, quadruple post. I have no problem getting you a throh for a gothita. I currently don't have the time to get a kyogre for you anytime soon so I'm going to have to decline on that, for now atleast. PM me with your time zone and availability. I didn't see anything in particular that I wanted for my Volcarona & Snivy. However if you'd opt for EV training them and then trading me a clone when you're done that'd be fine as well. Let me know. Bumping my page to keep everyone aware that this thread is still active and accepting new and old business alike. Just bumping my page to keep everyone aware the thread is still active and open. How's it going. I was looking for a Vulpix(any type) an Eevee, and a ditto. Any help would be awesome. Quick question. On your initial post, are the wants up to date? I don't want to waist your time by making offers you don't need. Thanks in advanced. Yes, everything is up to date. What gen are these requests for? Looking for gen V. Finally getting around to White 2. 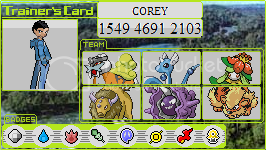 Been a while so i wanted to get my old team together. from the gen 5 want list i have. i would have to dig up my other games to check other gens. M or F dream world swablu. the Vulpix is the one i would want the most. thanks in advanced if you can help me out at all. I can supply you with the eevee and ditto for the female dream world swablu. The Vulpix is worth a little bit though. Do you have anything that may be of interest that isn't on my wants list? Any Rare/bred moved pokemon? Afraid with out getting the national dex and trasfering stuff from my pearl, platinum, and soul silver all i really have of worth would be a growlithe and a servine on my copy of white2. on my copy of black i have a gothita and a couple of pansears and a panpour that would be available. if any of those interest you i would want the vulpix on the white 2 copy. What do you have on your Gen4? I can always take your offers on Gen4 and supply your pokes on Gen5 if need be. I do have your other 2 requests at the ready. on the gen 4 stuff i have a laundry list of legendary, shineys, etc... just dont have a national dex on my other games to transfer them up for easy trades across the net. Also, what would we like to have set up for the current trades? You said dw swablu for the eevee and the ditto. Did any of the others i mentioned catch your interest for the vulpix? So far we have your female DW Swablu for my Eevee and Ditto. As for the DW Vulpix, perhaps one of your Gen4 pokemon as your current Gen5 offers for it aren't not really equal in value. If you'd be ok with a non DW one however, a Gothita would be perfectly acceptable. a non dream world vulpix would be perfectly fine. i was wanting to do some creative breeding with it anyways. on b/w 2 my F DW swablu for eevee and ditto. and a non DW b/w 2 vulpix for a gothita on black version? i am sry to say i have made a mistake in my listing. turns out the swablu i have are from the dream radar, not the dream world versions. i am very sorry for the mixup. i would still like to trade the gothita if that is ok. again sorry about the mix up. That's fine, let me breed the Vulpix and we can do the trade. Ok. Lets do the black version trade first and get you the gothita. Then we can to the BW2 trade for my vulpix. I really appreciate your help in getting my party together. If you are on, i have a wifi room set up for the trade on my copy of Black. time is 8:31 here. i will keep it open for an hour. hope to see you here. Had to reregister to my new system on black new friend code is 4685 9449 2174. If we cant connect make a post and we can try and figure this out. thanks again. Well i didnt see you on tonight. Let me know what times are good for you. i get off work at 5 home by 6:30-7. so evenings work best for me. let me know whats good for you or we can shoot for the weekend. talk to you later. I'm hoping to be available for your times tomorrow. You appear to be about 6-7hrs ahead of me however. If tomorrow doesn't work the weekend definitely will! Here's hoping for contact. I just got home opening up a wifi channel on my black copy. Let me breed it really quick and we can trade away!